We are able to offer the highest quality tooling services through our long standing relationships with UK and overseas toolmakers. Along with our own in-house capabilities, we have strong ties with several UK, European and Far East toolmakers. These relationships allow us to offer high precision, high quality multi cavity tooling at competitive prices and in most cases with sensible lead times. 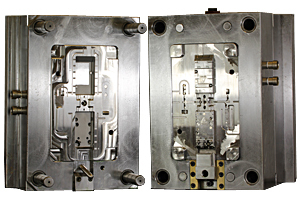 We work closely with each customer to source the most appropriate tooling option for their needs. Our in-house toolroom is equipped to repair and maintain a full range of tooling and other production equipment. Inoplas carries out a full design review prior to the manufacture of injection mould tools to ensure confidence of mouldflow, gate position and shrinkage concerns. This attention to detail, sampling and fine tuning improves production lead time and ensures products are manufactured to customer specifications every time. Tooling ranging from a few kilos up to several tonnes is manufactured to our specifications and we maintain total control of and responsibility for the entire process and the provision of PPAP / ISIR documentation where required.